Newcastle United player Nikos Dabizas has escaped from a crashed car just seconds before it burst into flames. The Magpie defender, who is now on the transfer list, was celebrating after Greece's 1-0 European Championship qualifying win over Ukraine on Wednesday. Greek police say the 29-year-old player's car is thought to have developed steering problems. The car crashed into traffic lights in Athens. 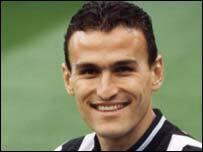 Dabizas, who joined Newcastle in March 1998, managed to get out of the car before it caught fire. A spokesman for the Greek football federation, said the player was taken by ambulance to hospital with a broken arm. No-one else is believed to have been involved in the incident.